Did you enjoy chemistry class in high school? Me neither. 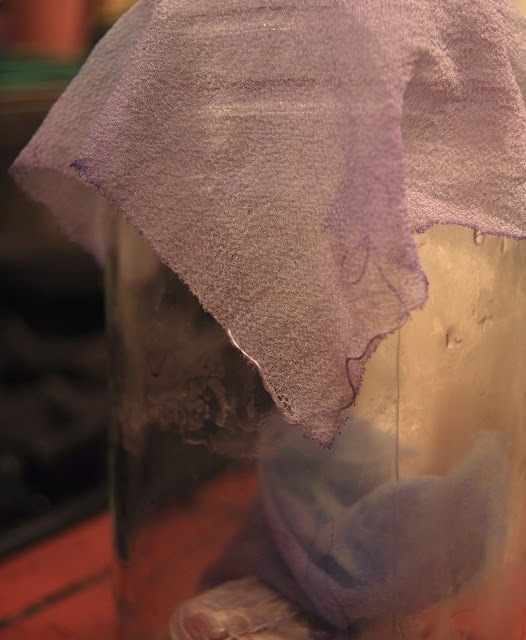 But the world of natural dye, now these are some chemical reactions I am really excited about. There are so many interesting and surprising combinations out there. Plants do all these crazy things you would not expect. Much like ceramic glazes, these colors are not necessarily intuitive, and that only serves to make them all the more fascinating. I have a feeling this is a rabbit hole I could fall really far into... I have my eye on another dye class already. Plus, my classmates were all wonderfully funny, creative interesting people, and I can't think of a nicer way to spend a Saturday afternoon. The above are photos from the class (not many, sorry, I was busy getting my hands dirty) and below are some of the beautiful samples I got to bring home with me. We dyed with a whole head of red cabbage, and a large zip-lock bag full of black tea. The black tea made for some beautifully shimmering, golden browns, but in the dark last night I couldn't get a good picture. With tea, the differences in color that result from using different additives is very subtle - but exquisite. Hopefully I'll manage to snap a good shot for you in the near future. From left: cabbage with no additive; cabbage with lemon, cabbage with baking soda, cabbage with iron. We also used avocado skins, which was easily my favorite part of class. Those cabbage colors are intense - a very disneyland princess mermaid palette - but avocado skins dye things pink. The most beautiful, soft, shy, blushing, multifaceted, dusty rose, living shimmering pink. It was by far the most exciting revelation of class for me. While I don't have a good image of this color right now, I promise you I'm revisiting this project. I've already started collecting skins for my own dye bath at home. As the class was only four hours, we dyed with silk to maximize our time. I learned that plant fibers such as hemp, cotton, bamboo, etc., take many more hours to fully absorb a rich deep hue, whereas animal fibers such as silk, wool, alpaca, etc., dye much faster. The more astute among you realize this means I have several yards of white cotton I didn't use in class. Never fear, I was so inspired I came home and right away set half of my own onion skin collection on to boil. Two of my pieces have been soaking now for almost 3 days, and I am quite pleased with the results. I promise to share very soon. I am absolutely amazed at those beautiful colors! Wow! It's fascinating the changes in color that the additives make. Looking forward to seeing more of this. What did they say about the way the dyes will last? Do they fade quickly? This is AMAZING!!!! Oh, my goodness!!! I absolutely must try some of this........I guess I'll run that knit picks order. In spite of the fact that I live in "quilt city usa", and we have quilt shops galore----you can't buy a piece of linen here! yarn it is. do you have to 'set' the color with some kind of additive? 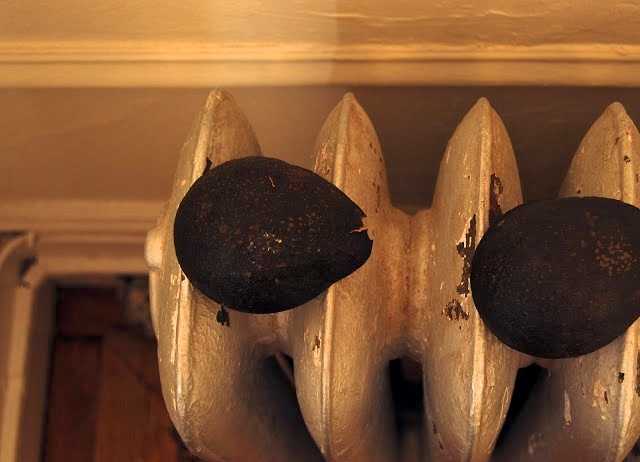 I can't believe the avocado skins!!! thanks for sharing!!!! such lovely colours! avocado dye is my favourite colour result too! add a drop of iron water or rust water and you get some gorgeous greys too! !